If you walked into our house today, you’d find at least one piece of IKEA furniture in every room of our house: my dresser, the girls’ shelves, the bookcase in my office, and the children’s table in the living room. We are an IKEA family and make the two-hour trek to Cincinnati a couple times a year to stock up on things we just can’t live without. So as I read Horrorstor by Grady Hendrix, it was like I was living it with the characters because I was so familiar with the store. 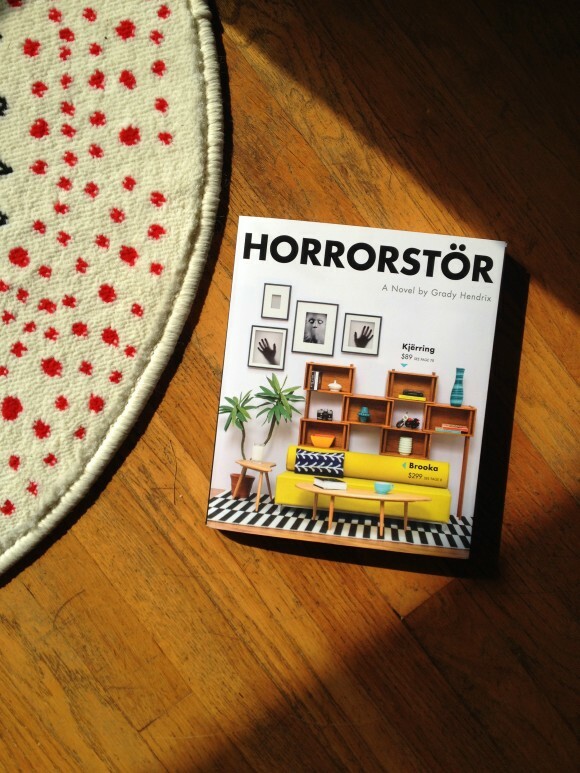 Horrorstor is a fun book packaged in an IKEA-lookalike catalog. Seriously clever. This alone made me excited to read it. Which is good because I don’t normally like scary stories due to my overactive imagination that makes life ridiculously complicated for the next few weeks until I forget the plot. Like “I’m afraid to put my feet over the side of the bed and I won’t go down in the basement without all the lights on” complicated. But I read Horrorstor anyway and don’t regret it one bit (who needs to go down in the basement for a few weeks??). The story revolves around ORSK, an IKEA-knockoff located in Cuyahoga, Ohio. Inside the store are your average employees: the hardworking but annoying manager, the lifelong dedicated employee, the dissatisfied twenty-something, etc. Recently when the morning shift arrives, there has been unexplained damage around the store, a soiled couch, knocked-over shelves, and other things that don’t add up. So when Manager Basil rounds up some employees to stay overnight in hopes of catching the culprits, the group is in for an evening they won’t soon forget. An evening some of them won’t survive. I loved this book. Each chapter introduces an ORSK product with pictures and description and the back of the book has everything from coupons to store locations. As the characters travel through the store, you can imagine yourself there because the store layout is identical to an IKEA warehouse and Hendrix is so great with the descriptions. It definitely makes the story come alive to have been where the characters are. It’s also a little creepy and is going to completely change my next trip to IKEA. I’ll definitely be trying to open some of the fake doors while I’m there too. Horrorstor by Grady Hendrix is a fun, frightening read that will keep readers entertained. Lovers of scary movies and books won’t be able to put it down and lovers of IKEA shopping will find it slightly unsettling while inexplicably feeling the need to get to an IKEA very soon. Grab this one, it comes out September 23rd, and would be a perfect read as we head into fall and Halloween. DISCLOSURE: THIS IS A SPONSORED POST BUT ALL OPINIONS ARE MINE. AFFILIATE LINKS USED.